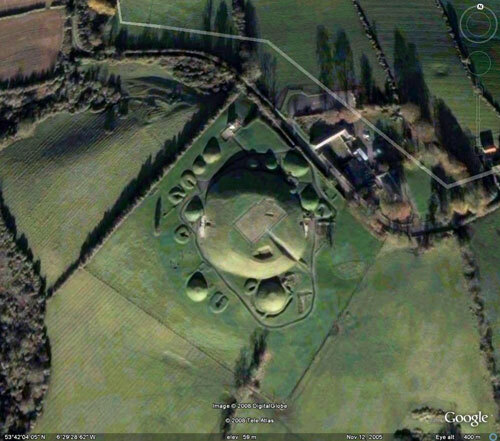 In addition to Newgrange there are two other equally large cairns in the Boyne valley, Dowth and Knowth (and aproximately 35 other smaller mounds). 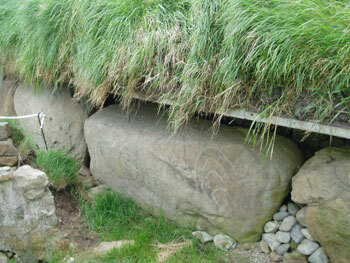 N.L.Thomas (Irish symbols of 3500 BC, Mercier Press, 1988) has put forward an argument for K15 to be a calendar stone. 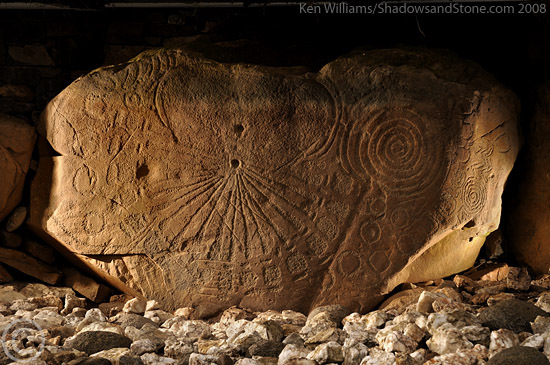 He suggests that the hole in the centre of the stone represents the sun. 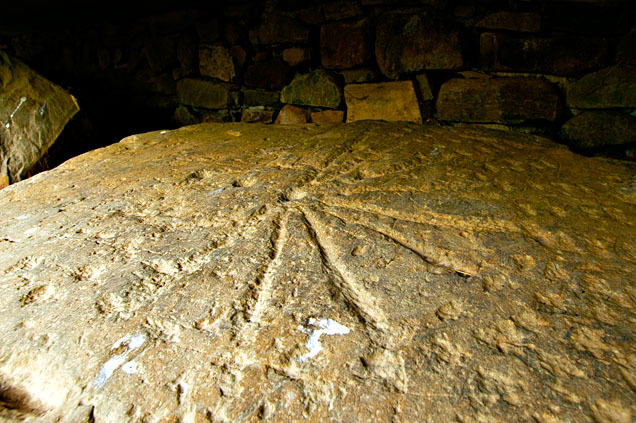 Above, in the picked area of the stone inside the concentric arced lines is a hole representing the moon, and the stars are the picked marks. The twin arced lines indicating a solid shell over the earth to represent the firmament. The radial lines are seen as the sun's rays reaching out to the semi-circle of 16 squares which represent the 16 months of his proposed Neolithic year. The Neolithic people in Ireland aligned their megalithic monuments at Brú na Bóinne to the major solar events - the Winter Solstice, the Spring Equinox, the Summer Solstice and the Autumn Equinox. These divided the year into four quarters. The half way points between these major solar events, the cross quarter days, are Imbolc, Beltane, Lughnasadh and Samhain, which mark the turning of the seasons and further subdivides the year into eighths.One eighth of a year is approximately 45 days so a further subdivision gives sixteen 'neolithic months' of approximately 22 days each. ....and also Kerbstone K7 which has an easily recognised sundial carved on its upper face. This sundial is now permanently in shadow due to an overhanging concrete ledge which was installed during reconstruction work to protect the kerbstones from damage. 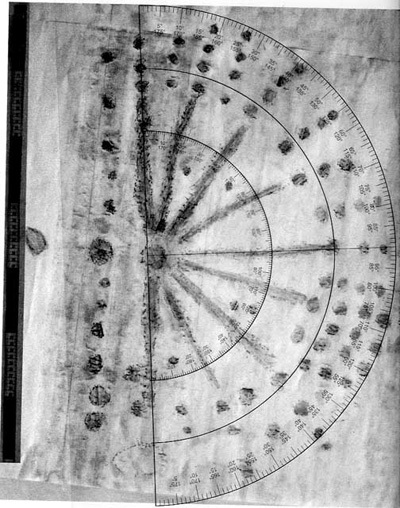 Tracing of the sundial overlaid by a transparent protractor for analysis purposes. See "British Sundial Society Bulletin Vol.21(iii)Sept 2009"
Carved into the top of Kerbstone K7 on the eastern side of the mound, the sundial is divided into 8 sectors, the dividing lines terminating in four dots. The space between each line is further sub-divided by four dots forming the pattern as shown in the finger rubbed tracing above. It has 2 other holes for the location of a gnomon in addition to the centre hole on the east/west. line.